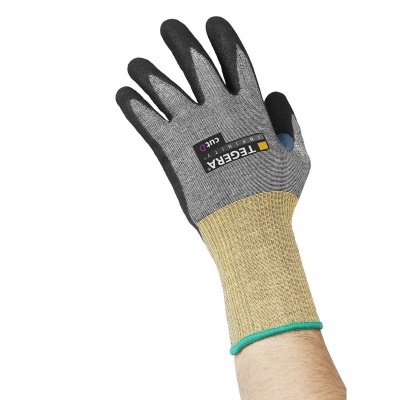 With a soft grip and an extended cuff for wrist protection, the Ejendals Tegera Infinity 8811 Level D Cut Resistant Work Gloves are ideal for assembly applications in oily or cut-risk environments. 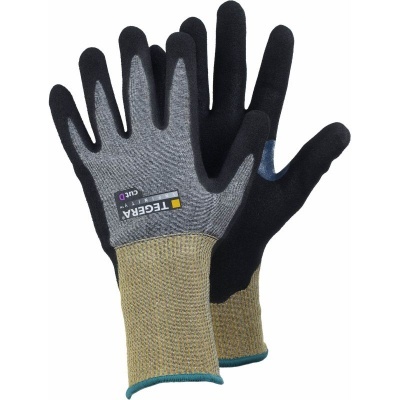 With glass fibre thread/HPPE liner and a nitrile-coated palm, these gloves provide good contact heat resistance and are even safe for use with food. The palms of the Ejendals Tegera Infinity 8811 gloves are dipped in a mixture of nitrile foam and water-based PU (polyurethane), and finished with a foam grip pattern. This ensures that they are resistant to greases and oils – ideal for any task that involves handling oily components or machinery. The back and cuff areas of the glove are left uncoated, ensuring that good ventilation and user comfort are maintained. The Ejendals 8811 Palm Dipped Precision Work Gloves are able to withstand contact heat up to 100°C. While this is not enough to resist sustained high temperatures, it does provide peace of mind for mechanical or assembly line work, where objects can become warm. Please watch the video below for a short demonstration of the Ejendals Tegera Infinity range's key features. The Ejendals Tegera Infinity 8811 are available in several different sizes. Please measure the circumference of your hand around the knuckles (excluding the thumb) with your hand open and your fingers together, and the length of your hand from the tip of your middle finger to your wrist.